As 2016 draws to an end, we're leaving a successful year behind and moving forward together, driven by our passion for electric mobility. We hope that you and your family have a relaxing holiday season and good start to the New Year. For environmental reasons, we've decided not to print our usual Christmas greeting. Instead, we're donating the sum that's usually reserved for this to the Rhein-Mosel-Werkstätten (workshops) in order to contribute to the integration of disabled persons into our society. Patrik Tykesson (middle) presents the €500 check to the coworkers and manager of the Rhein-Mosel workshop, Mr. Thomas Hoffmann (right). Let's change the streets of tomorrow together next year! 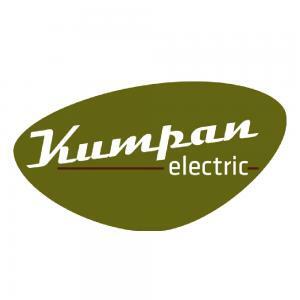 Please invite your friends, acquaintances, and business partners to join the Kumpan family as well. Follow us on Facebook, Instagram, YouTube, and Twitter and experience the electric revolution live.